4 Mini pizza bases topped with tomato sauce, Mozzarella full fat soft cheese, cooked beef and roasted onions. Have this your way four mini pizzas with tasty ground beef, cheese and tomato topping, or alternatively, for a larger appetite, place two pizzas together to make a burger; perfect for a quick snack, straight from the microwave. INGREDIENTS: Wheat Flour, Water, Mozzarella Full Fat Soft Cheese (Milk) (13%), Cooked Beef (10%), Tomato Purée, Rapeseed Oil, Sugar, Yeast, Salt, Pea Starch, Spirit Vinegar, Roasted Onions [Onion, Sunflower Oil], Dextrose, Wheat Starch, Potato Starch, Spices, Dried Herbs, Dried Garlic, Onion Powder, Sunflower Oil. For allergens, including cereals containing gluten, see ingredients in bold. Also, may contain Celery. Instructions: 220°C /Fan 200°C/ Gas 7. 10-12 min Place in a single layer on a baking tray, with the toppings facing upwards. Cook in the middle of the oven for 10-12 minutes. 4 Mini Pizzas that can be eaten individually or made into 2 Pizza Burgers. 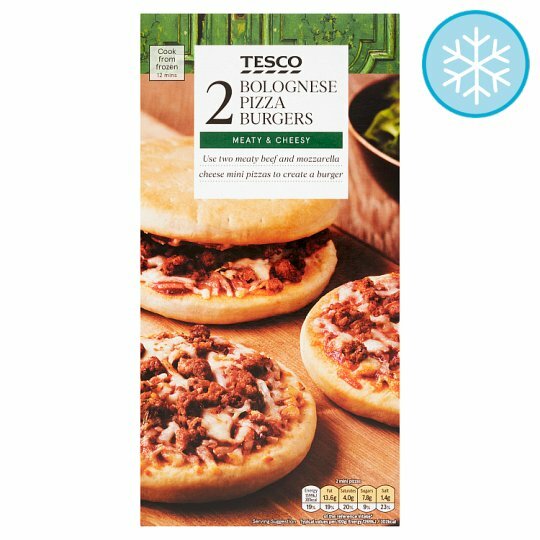 4 Mini Pizzas that can be eaten individually or made into 2 Pizza Burgers.